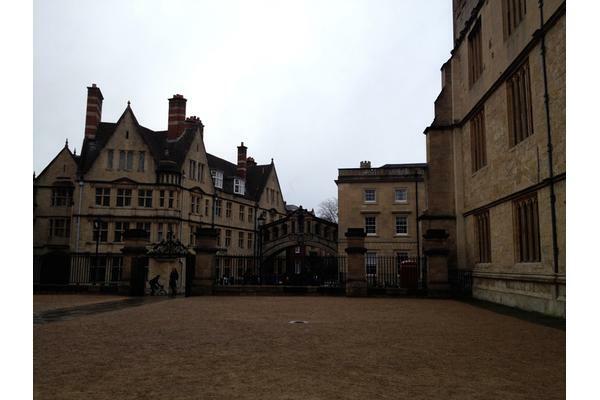 This blogpost was written with permission of the Master and Fellows of University College, Oxford. 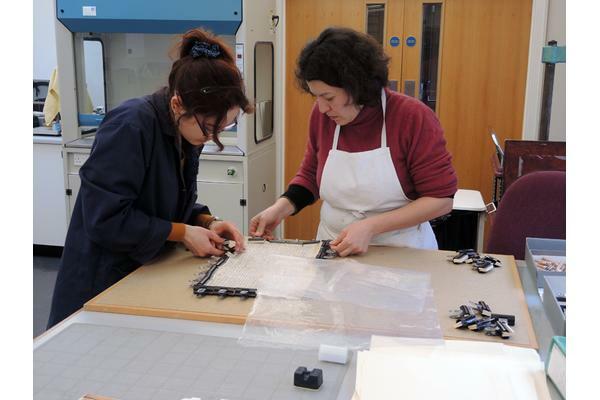 During my postgraduate work placement in the Oxford Conservation Consortium, I worked on various projects and with diverse materials like paper, leather, and parchment. Figure 1: View of the bridge of sighs, Oxford. 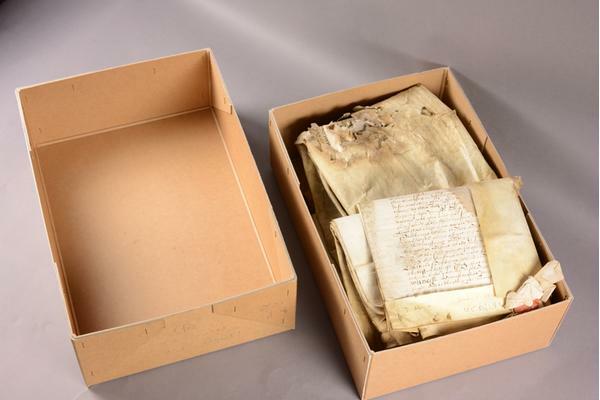 Before going in the Oxford Conservation Consortium, I had only little experience with parchment conservation. 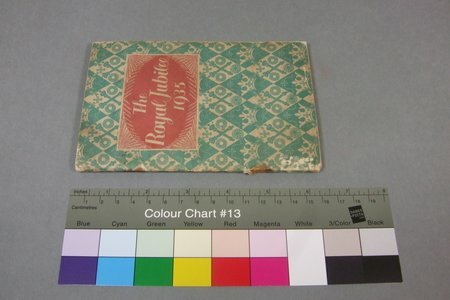 In order to improve my skills and knowledge about this material, I had to take care of an on-going project on leases for properties of Oxfordshire from the University College archives. 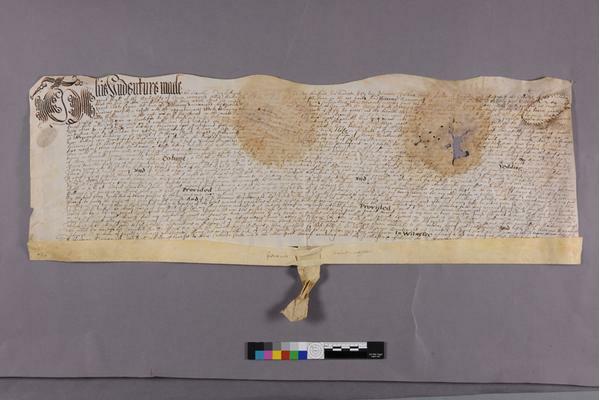 These documents from the late 16th to the late 17th centuries were mainly written with iron gall ink on parchment and most of the time, they included one or two wax seals. 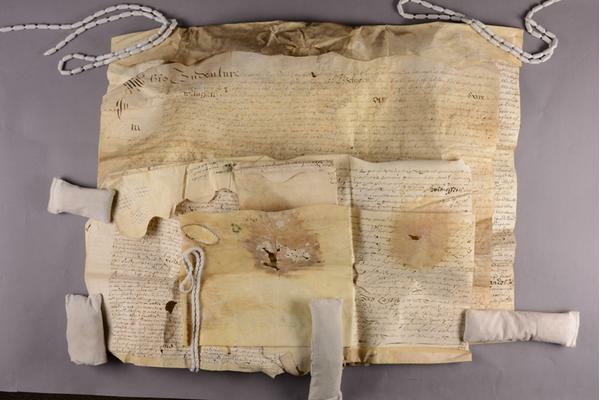 The documents had suffered from poor storage in the past: several leases at a time were tied together with a parchment strip, then were rolled up in bundles in the early 18th century, and left aside for years. 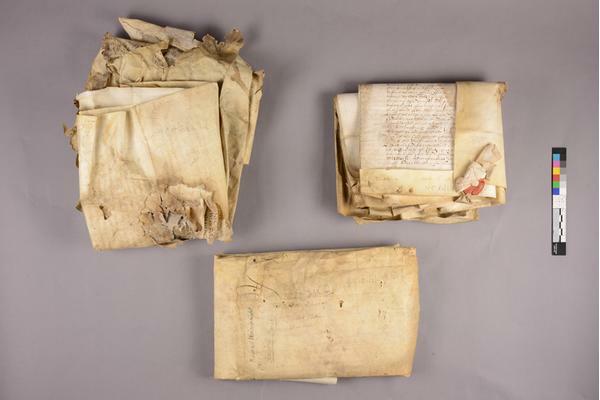 A conservation project started to take care of the damaged parchment, which had become stiff, dirty and showed some losses. 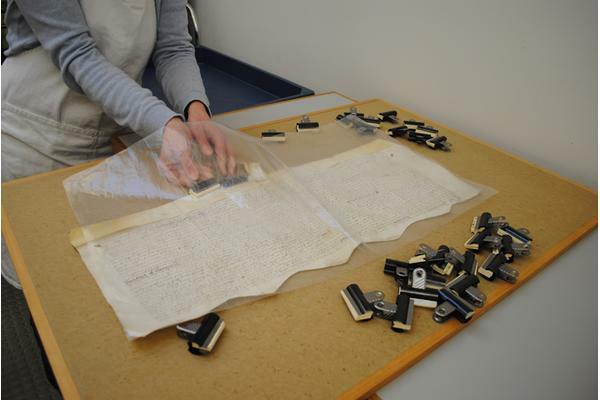 The purpose of the work was to clean the documents, flatten them and consolidate them in order to store them flat in archival boxes. This will allow an easier and safer handling of the leases, therefore providing a better access to research and study. On arriving in the studio, we saw that several bundles had been packed together in brown cardboard boxes. Reference pictures were taken of the bundles before starting the conservation work. Figure 2: Reference pictures before treatment - boxes from the archives. Figure 3: Reference pictures before treatment—three parchment bundles. Figure 4: Reference pictures before treatment—unfolding bundles. The first step consisted of removing the parchment strips that held the leases together. The thin strips were stiff and unwilling to move. 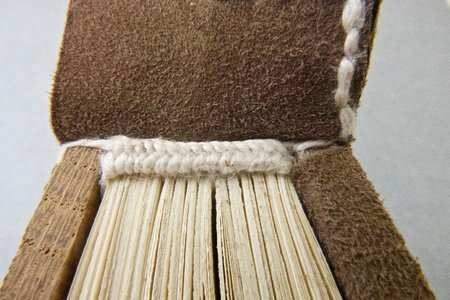 To untwist them without breaking them, the parchment had to be gently worked by pushing and pulling to relax the material and release the knot. Figure 5: Removing parchment strips. 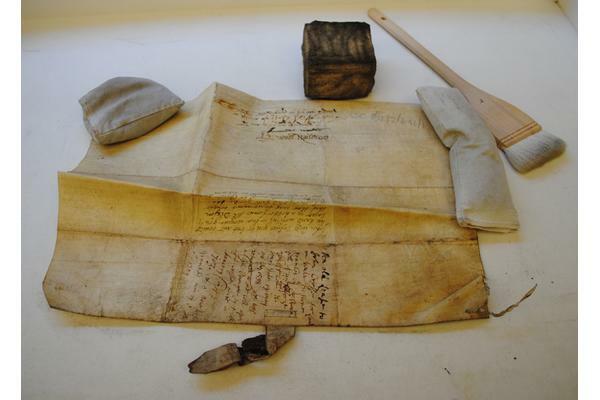 Each parchment document was afterwards cleaned using conservation smoke sponges and soft brushes. Fragile and brittle areas were only cleaned with soft brushes to avoid friction that could damage the support. Figure 6: Cleaning of the leases with smoke sponges and soft brushes. Once the support was cleaned, the leases could be flattened. In order to relax this type of material, the humidity level is slightly increased. A "sandwich" technique is used for this purpose, with the following procedure: first, deionised water is spread on a capillary mat placed on a flat surface. A capillary mat is a material which retains moisture and which is generally used in horticulture, to help plants to germinate by keeping them constantly moist. 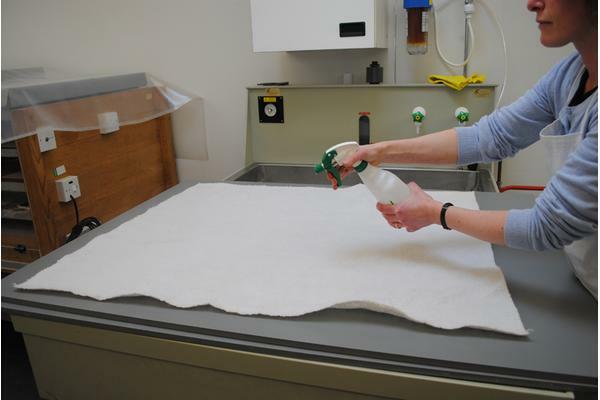 Figure 7: Flattening leases - humidification of capillary mat. A sheet of Gore-Tex®, a material designed to be water-repellent but to let moisture vapour pass through it, is then placed on top of the capillary mat. This will allow moisture to relax the parchment, without water being in direct contact with the material. The document is then placed on the Gore-Tex®, as flat as possible. Small glass weights can be used to help keep the document flat while placing a sheet of polyethene on top of it. This completes the flattening structure, by allowing the humidity to be encapsulated under the polyethene sheet. 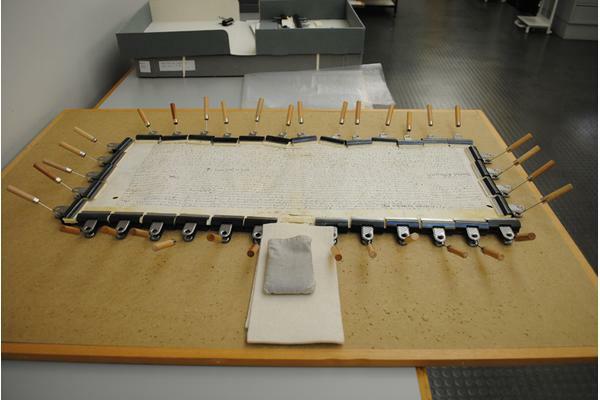 Glass weights are placed around the documents, on top of the sheet. Figure 8: Flattening leases - item placed under a polyethene sheet. The document's condition is checked regularly, to assure that the humidity level does not exceed the necessary amount to relax the material. 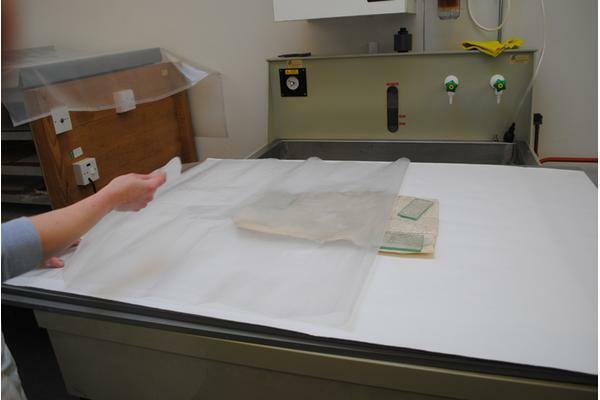 Figure 9: Flattening leases—relaxation of parchment with humidity. When the parchment is flattened, it is time to stretch it. 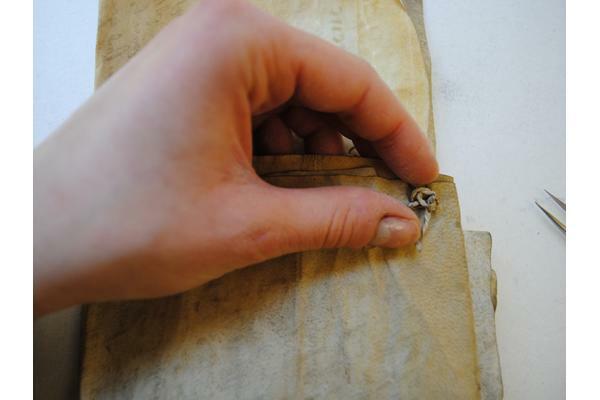 This operation is necessary to ensure that once dry, parchment will not go back to its previous shape. But why do we need to stretch parchment? This relates to the way parchment was first created. After removing the hair and flesh during the processing of the skin, the parchment maker soaks it in water. Then, he stretches it tightly on a wooden frame, like a canvas, to carry on the preparation of the skin. After scraping and thinning the skin, it is left to dry under tension. The same process had to be recreated in order to flatten the leases. For this, the relaxed document was quickly surrounded by bulldog clips on a pin board. 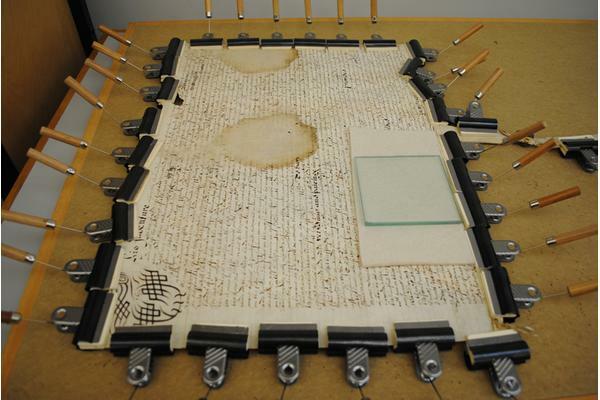 The parchment is afterwards stretched gently on the board by securing the clips with metallic pins. The tension does not have to be too strong, but enough to maintain the parchment as flat as possible. The parchment can be left to dry under tension. Figure 11: Stretching parchment—pinning on board. 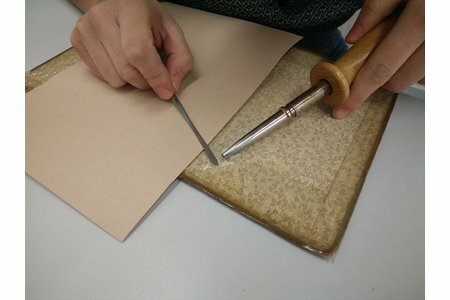 Figure 12: Stretching parchment—pinning on board. 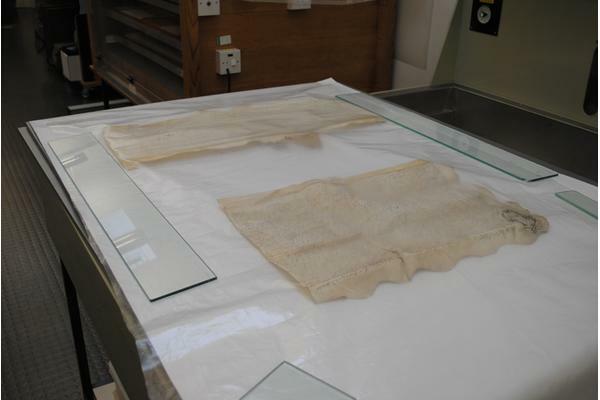 When nearly dried, the pins and clips were removed and the parchment was placed under blotting paper and left to fully dry under weight. The flattening was then completed and further consolidation of the support could be undertaken if necessary.